Americans consume more chicken on average than any other animal species, according to the U.S.Department of Agriculture. When compared to red meat, chicken provides a relatively healthy source of protein. A slow cooker, or Crock-Pot, can be an ideal method of preparing dinner in advance — simply place your ingredients in the Crock-Pot in the morning, turn it on, go about your day and return to a ready-to-eat meal. You can take steps to ensure that poultry cooked in this way will turn out tender, moist and delicious. Invest in a quality Crock-Pot. Less expensive versions might cook unevenly. Also, 21st-century Crock-Pots cook at higher temperatures than their forerunners in the 1970s and 1980s, which can dry out the meat. So consider purchasing a version with a lower wattage or a “keep warm” setting. Also, choose a glass lid rather than a plastic one. Purchase a whole chicken or chicken legs, thighs or drumsticks. The darker and fattier the meat, the more moisture will be available during cooking. Avoid chicken breasts, as lean white meats tend to dry out. Defrost the chicken if frozen. Leave the bone in and skin on. Dry-rub, marinate or brine the chicken. You can simply rub butter or oil under the skin or try a marinade of olive oil, spices and either vinegar, white wine or lemon juice. Or brine the meat by soaking it in a salt water solution and allowing it to rest in the refrigerator. These procedures will tenderize the meat by dissolving tissue and protein, helping to reduce moisture loss during cooking. Remove the chicken from the marinade or brine and insert it into the Crock-Pot. Add any vegetables or spices. Pour in liquid such as water, chicken stock or soup so that it completely covers the chicken. Set the Crock-Pot to the lowest setting. Cooking times will vary based on the size of the chicken and the temperature of your Crock-Pot. Check the Crock-Pot occasionally to ensure that enough liquid remains; if not, add more. Measure the internal temperature with a meat thermometer. 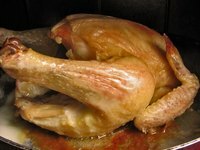 Place the thermometer in a thick part of the chicken meat, away from any bone or fat. When it has attained a temperature of 165 F, it is done. Do not overcook, as this will surely result in a dry chicken. If your Crock-Pot has a “keep warm” setting, you can cook the chicken on this setting; however, it will take longer to cook. Today’s Modern Woman: How Can I Keep My Chicken Moist While in the Crock-Pot?